Happy New Year dear friends! I guess all of you have made your resolutions. Wishing you all the very best to keep up with them to achieve your goals. 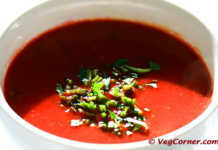 I would like to kick-start a soup recipes series with this tangy tomato soup recipe. I have been trying a variety of soup recipes over the past one month. Most of them turned out very good. I will be sharing the best among those in the following days. Why would I blog about something as basic as tomato soup? Because it’s the best. You might think that I’m over marketing something quite simple, but I have a reason for it. Do try this method of preparing tomato soup and you will never go back to your old recipe. Caramelizing the onions and using homemade vegetable broth is the secret. 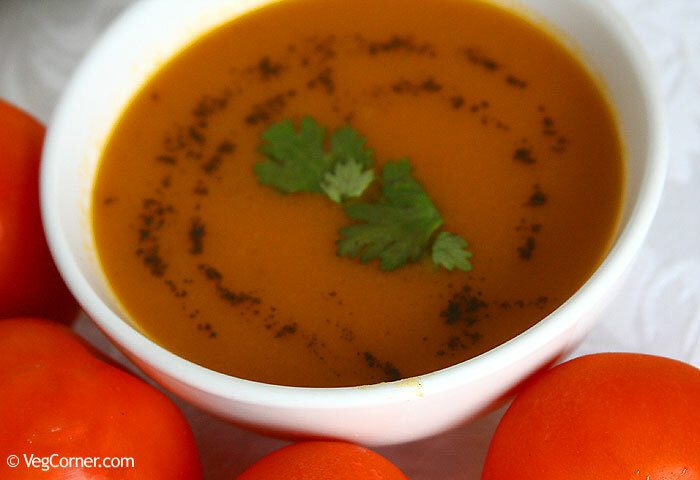 Easy to make tomato soup recipe with rich flavor and texture which makes you want more. In a pressure cooker/pan, heat the olive oil. Once it is warm add the chopped onions and fry for a couple of minutes. Also, add a little salt (about 1/8th of a spoon) and a pinch or two of sugar. The salt is added to quicken the cooking of onions and I added the sugar to caramelize the onions. This process gives a very good flavor to the soup. It may take up to 8-10 minutes for the onions to brown completely. The onions will start sticking to the pan, so at this time you can add a couple of tablespoons of the vegetable broth or water to de-glaze the pan. Then add the diced carrots and ginger and fry for a couple of minutes. 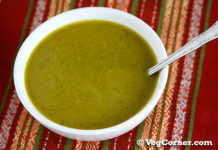 Carrot or beet is added to give a nice color to the soup. It is purely optional. Add the chopped tomatoes, some more salt (about a teaspoon) and a pinch of pepper; fry for a couple of minutes. Now add about 3 cups of the vegetable broth or water and stir all the ingredients together. Close the cooker lid and cook for 1 whistle. Once the pressure is released, open the lid and blend the tomato mixture with an immersion blender. If you do not have an immersion blender then wait for the soup to cool completely and then puree it in a food processor or a blender/mixie. If it is not cool enough when you blend it, be prepared to spend the rest of the day cleaning the kitchen because it is going to splash out like crazy. Don’t tell me that I didn’t warn you! Puree the soup as smooth or as chunky as you want it to be. It’s all personal preference. I like my tomato soup smooth, creamy and velvetty. Add some more broth/water to get the consistency you like. Also, season it with salt and pepper to suit your taste. Simmer it for a couple of minutes in the low heat and serve the soup warm with some breadsticks or crackers. I have prepared tomato soups before but this is by far the best I have ever made. I think the reason is two-fold, one being the caramelizing the onions and secondly the flavorful homemade vegetable broth. The soup was smooth and tasted very rich like it was a takeout from a 5-star restaurant. I don’t think I’ll be making tomato soup in any other method other than this one. Why to experiment when you already have the best? You can prepare this cook on stove top in a regular saucepan/stock pot. Pressure cooker is not a must. In that case, you will have to cook the tomatoes for about 20-25 minutes and then proceed with the rest of the recipe. I would definitely recommend investing in a good immersion blender. For about $20 you can get decent blenders. Making smooth, creamy soups is a breeze with the blender. Otherwise you will have to wait for the soup to cool completely, then transfer it to a food processor/mixie and process the soup in batches for large quantities and wash a lot of dishes. You can avoid all of this by using an immersion blender. Happy new year! Am glad to see healthy stuff, guess we both are trying the same thing. rock on! baking apram pathukalam! 😉 naanum blogging resume pannanum irukken, chooddham! Happy New Year to you too Porkodi. Believe me or not I was just checking your blog too, maybe 10 minutes back. Sema telepathya irukke! 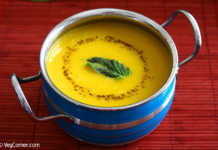 The soup looks very yummy and I am glad you tried the Raghi Morkali recipe and liked it.